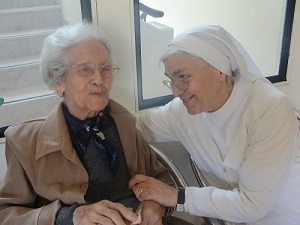 We, the Missionary Benedictine Sisters of Tutzing in Torres Novas, Portugal, render our missionary service to people of all ages. Since 1991 we have our Nursing Home, “Casa São Bento”, in which a holistic care is given to each and every one who seeks our assistance. We take care of the person as a whole, physically and spiritually. The Home has a capacity for 37 residents. At present, we have 35 men and women between the ages of 67 and 98; some have Alzheimer, others have suffered a stroke and others are too old or too weak to take care of themselves and their families cannot take them in, but they are very frequent visitors. Some are bedridden. Almost all are totally dependent. Sometimes we take in people who have undergone medical surgery and seek our assistance and stay with us in the Nursing Home during their recovery period. Two Sisters in our community are nurses. We, the Sisters, in collaboration with our 25 employees, the Doctor and a Social Worker, work together in promoting quality of life to our residents. Some take part in our Celebration of the Eucharist; some do so through a loud-speaking system in their rooms and in the hall. All who desire it are able to receive the Holy Communion during the Celebration, even those who are not physically present. Our Chaplain also gives them the opportunity to receive the Sacraments of Reconciliation and of the Anointing of the Sick. Thus they can prepare with dignity for the coming of the Lord in their final moment. Once in a while, especially to prepare for Christmas and for Easter, we invite their families for a feast with their loved ones. This is much appreciated both by the residents as well as their families.